Production of Unitary Enterprise "The self-supporting Pilot Production of the institute of Bioorganic Chemistry of National Academy of Science of Belarus" will be presented at the stand Unitary Enterprise "Belmedrechnics" - stand B3. on the new products - kit of reagents for the determination of free triiodothyronine in human serum or plasma by radioimmunoassay RIA-free T3 and kit for albumin determination in human urine by enzyme immunoassay method EIA-Microalbumin. 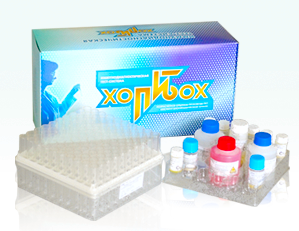 on the products for molecular biological research: kit of reagents for DNA isolation, enzyme preparation - a mixture of thermostable DNA polymerases TP-mix polymerases, enzyme preparation - Rpfu DNA polymerase recombinant thermostable, preparation enzyme - Uracil DNA glycosylase (UDG-LPI).